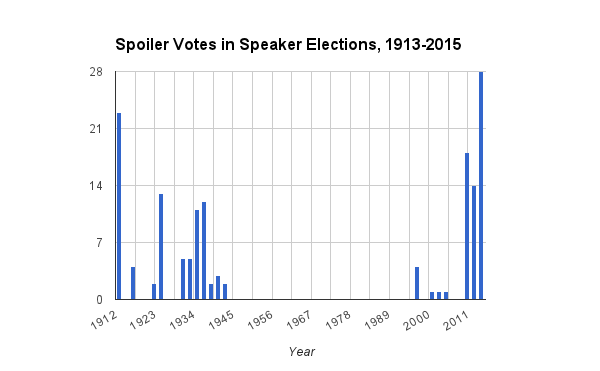 If past is prologue — and today’s Speaker vote suggests it very likely is — Boehner’s next two years might well be as rocky as his last two as the leader of a GOP conference that, at least in parts, does not want to be led. Compared to Gohmert and his ilk, Boehner seems like a conservative but ultimately rational member of the Rotary Club. To be sure, he mouths all the usual G.O.P. lines about President Obama usurping the constitution with his immigration reforms, and about the Affordable Care Act destroying the economy. But he has shown little enthusiasm for responding to points of contention with the drastic measures that some Republican ultras favor, such as impeachment or shutting down the government. “I don’t do anger,” he told Politico’s Glenn Thrush, whose new profile of Boehner is well worth reading. There have been many, in recent years, who wished for a stronger speaker, a speaker who sought compromise more aggressively and did more to marginalize House conservatives. Perhaps that speaker would have made the last few years more productive. Or perhaps he would’ve been broken by conservative dissatisfaction and replaced with a more authentic tea partier. Conservatives, meanwhile, have often wished that they had been led by one of their own — someone willing to truly maximize his leverage, someone who wasn’t, in his heart, so afraid of defaulting on the debt and defunding the government and launching impeachment proceedings. That would have been a disaster for the country, but it would have been a particular disaster for conservatism, which would have been blamed for the consequences. Boehner has managed to steer his conference between these extremes, and the result is, today, Obama is unpopular, his legislative agenda is dead, and Republicans have the largest House majority since the Truman presidency and a real chance to win in 2016. [E]ven setting aside worries about the possibility of passing legislation that the president will sign, to even get a piece of legislation to his desk will require at least a modicum of bipartisan support in the Senate, because the GOP does not control 60 seats in the Senate. Thus, for the GOP to come across over the next two years as a party that can govern as opposed to simply obstruct, Boehner and McConnell must work together with at least a handful of (presumably conservative) Democrats in the Senate. The question, then, is whether and how Boehner can manage this without angering the 20+ members of his own party that were happy to break with him on what is typically the most visible and partisan procedural vote of each Congress. Pelosi’s share of the vote for minority leader in the past three minority leader elections is the lowest for a minority leader since 1991. … The movement to voicing opposition in a public vote is probably much more of a performance art than anything else. It’s a way for members of Congress to show they haven’t gone “Washington.” With every part of a representative’s record being scrutinized in the media, members may find it worth their time to score points with supporters at home and potential donors on the web.